I’ve been under the weather for quite a while and it’s been a very difficult week. I was admitted to hospital overnight on Monday night for observation. But they didn’t find anything, so that, in itself, is a relief. I still have my headache though, which is a bit worrying. My favourite thing to do when trying to comfort myself is baking. Sometimes how I feel affects my baking results, but more often than not, I find comfort in the baking process. I felt the need to bake yesterday and I had dried figs in my cupboard that needed using. I intended to use the dried figs to make fig bars ala Fig Newtons but I wasn’t sure if I had all the ingredients. So my fig squares were born. They are lovely and squidgy and crumbly at the same time. They remind me slightly of Fig Newtons which made me excited to go home because I’m sure my mum would love them (she absolutely loves Fig Newtons!). I’m being very careful with my sugars so I’ve only had one tiny piece (yes, really) of the fig squares. But I’m happy to share the love, so here’s the recipe! In a mixing bowl, mix flour, salt and baking powder together with a balloon whisk until well combined. In separate a mixing bowl (am using a free standing mixer but you can also do this by hand with a balloon whisk), combine softened butter and sugars and beat until the mixture is smooth and fluffy (about 4 minutes by mixer and about 7-10 minutes if beating by hand). Add the eggs one at a time, making sure that the egg is well-combined before adding the next one. Add the flour mixture in quarters. It will look like you don’t have enough batter but it will be fine, I promise! Add the chopped figs and mix until everything is well-distributed. 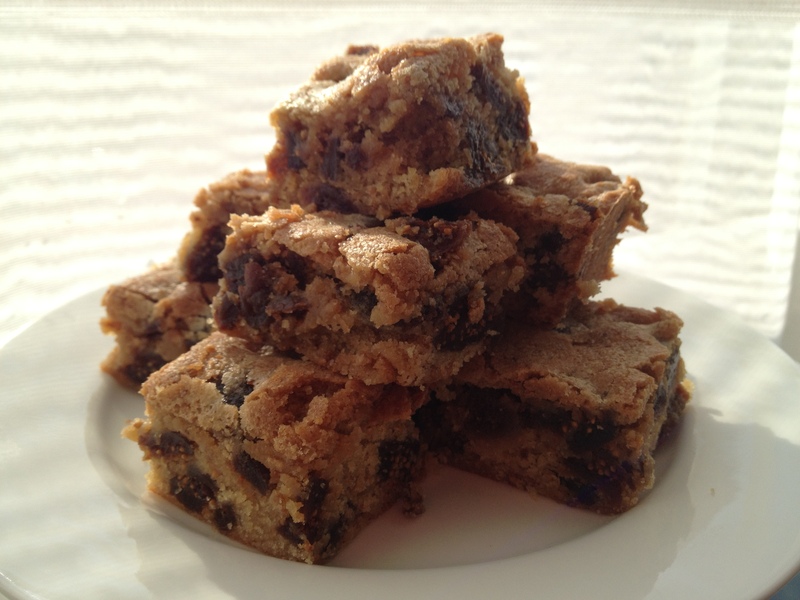 This recipe will also work with prunes, dates and raisins. If using raisins, it would be best to soak the same amount in about 75ml of water overnight until the raisins are plumped up. If you want a boozy version of the fruit squares, soak the fruit in about 30ml of either brandy or rum and add the fruit (with the brandy or rum) to the mixture. Next PostBaking pan de sal!